These beautiful paper bar coasters were blind embossed on an off white, linen card stock. 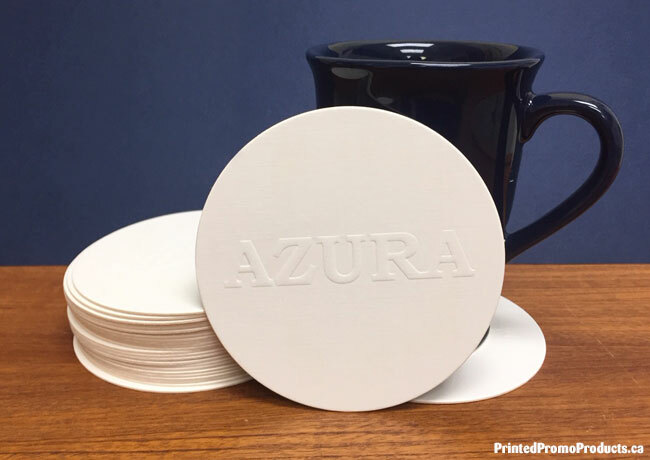 The overall thickness is 40pt (1mm), which is our medium weight and most popular option in our paper coaster line. Embossing leaves a raised impression of your artwork (design) on the paper which has already been printed or left blank (called blind embossing). Embossing is a perfect way to highlight your logo or a specific part of your design. A custom die and counter die are made for this process. 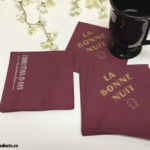 If you’re interested in embossed beer coasters or any other paper products, please contact us for a quotation. First impressions are everything and an impressive business card will make you and your company stand out. 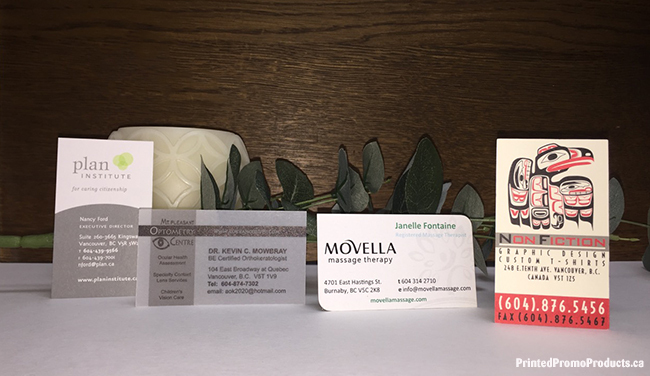 There are a number of ways to showcase your brand on business cards from the finish, texture, thickness, to the colour of the card stock you choose. The addition of laminate, foil stamping, embossing and raised printing can give your business cards extra dimension and can highlight key information. By creating a custom die cut shape you can emphasize your brand in a subtle and classy way. Don’t forget that the placement of your logo, ink colours and fonts are important factors as well. 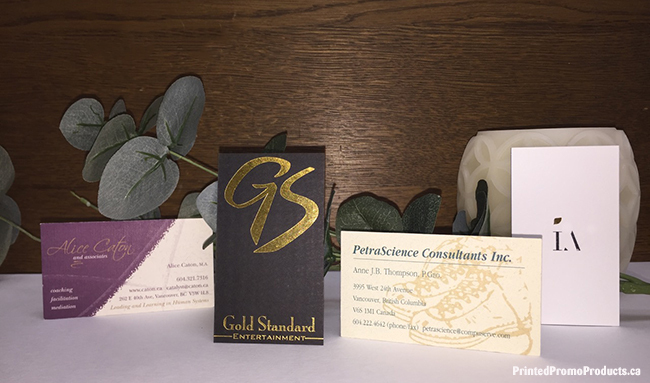 With 30+ years of experience, we can provide suggestions and ideas so that you and your company can effectively be represented with your custom business cards. We produce digital, offset and letterpress printed business cards in house. If you require more information and a quotation, please contact us. We also offer design services if you need any help. 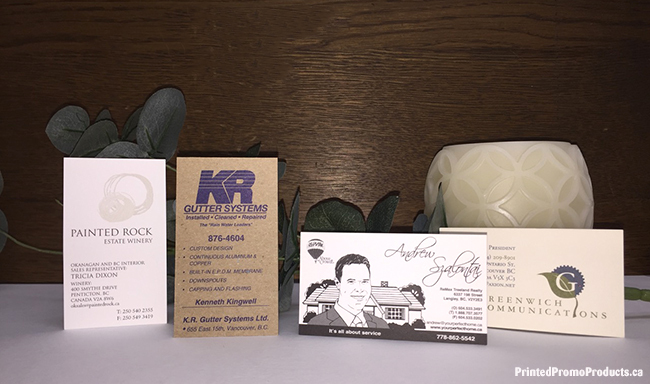 Request a quote on business cards or visit our Paper Products page for more info. These impressive and professional report covers can be used to present your proposals, bids, corporate reports and much more. Custom printed report covers are effective promo items that will provide additional brand exposure and will set your business apart. Front and back covers are available blank, with foil and emboss as well as digital or offset printed in one colour to full colour on linen cover stock. Paper colour options include white, cream, red, burgundy, dark blue, pine and black. Report covers are 8 3/4″ x 11 1/4″ and come with a die cut window on the front page. Window size options are: 4″ x 1 3/4″ and 3 5/8″ x 2 11/16″. Different paper options are also available. Minimum order is 25 sets. If you’re interested in ordering custom report covers, please contact us for a quotation. Visit our Paper Products page to see what other business marketing products we make. 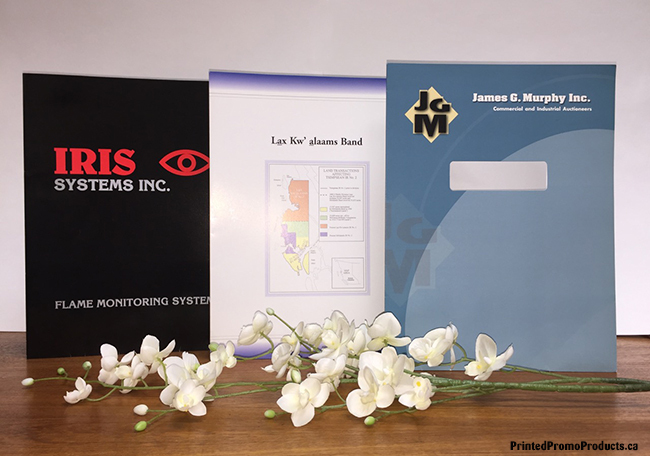 We custom print all your report covers on site at our Vancouver, BC location. Presentation covers are digital printed in full colour (CMYK). RGB and Pantone® colours will be converted to CMYK. Foil, emboss and offset printing are also available. Pocket folders are great promo products to display gift cards, receipts, tickets and documents. Why not present your clients with professional and organized packets while bringing additional awareness to your business. Pocket folders are digital or offset printed on standard white 120lb gloss card stock. Various paper finishes, coloured card stocks and printing with Pantone® and metallic inks are available as well. If you’re looking to add a touch of elegance – foil, debossing or embossing would be perfect. The minimum order for short run 9″x12″ folders is 25 units. For all other sizes, 100 units is the minimum. If you’re interested in ordering custom printed pocket folders, please contact us for a quotation. Visit our Paper Products page to see what other business marketing products we make. 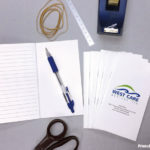 We custom print all your pocket folders on site at our Vancouver, BC location. Short run orders are digital printed in full colour (CMYK). RGB and Pantone® colours will be converted to CMYK. Larger runs will be offset printed. Present your personal or business correspondence, reports and proposals on our professionally printed stationery. 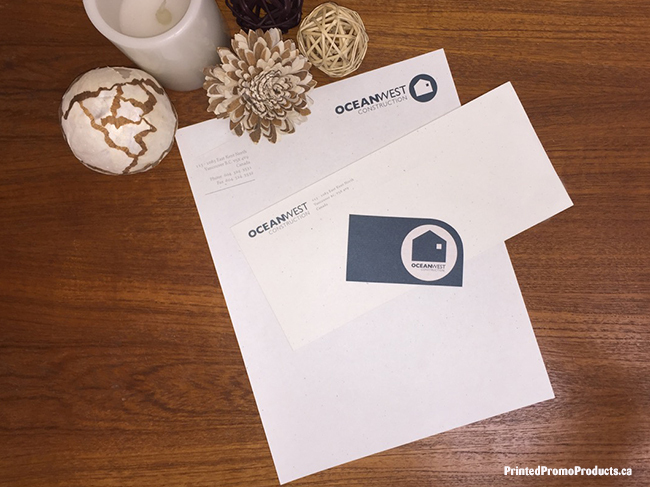 Letterhead and envelopes can be digital or offset printed in one colour to full colour as well as foil stamped and embossed. 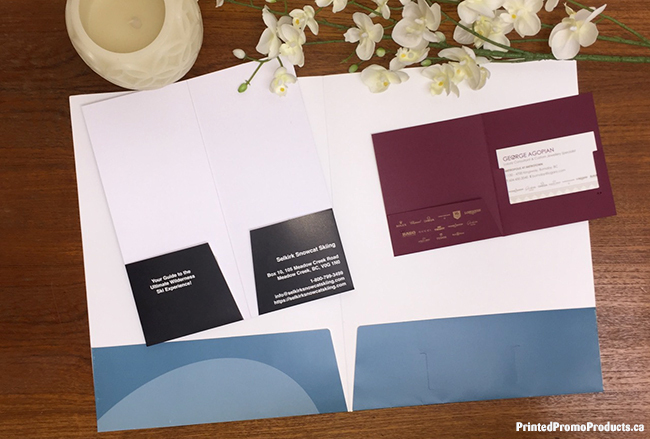 With the wide range of paper stock, colours and finishes available, your letterhead and 2nd sheets will look impressive when printed on premium quality paper. Stationery is available in smooth, linen, felt, laid, and fiber finishes in various shades of white and business colours including gray, ivory, blue and much more. 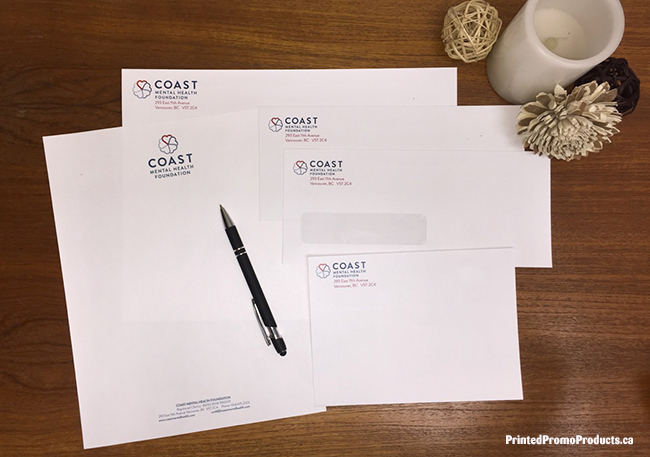 If you’re looking for matching executive letterhead (7 1/4″ x 10 1/2″) and statement size letterhead (5 1/2″ x 8 1/2″) let us know, we can help you with that as well. Printing with bleeds and watermark paper also available. 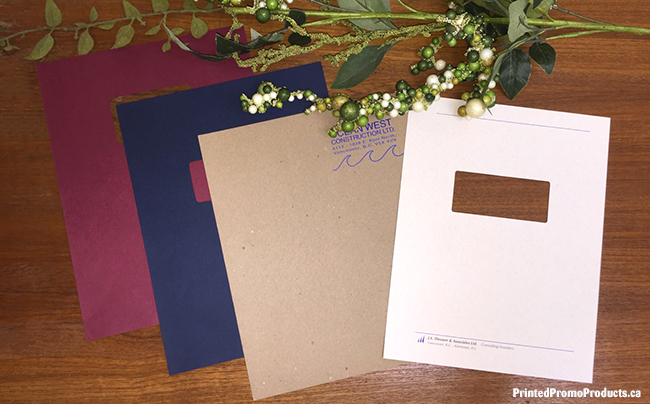 Available in white wove, natural kraft or matching paper to your letterhead and 2nd sheets. 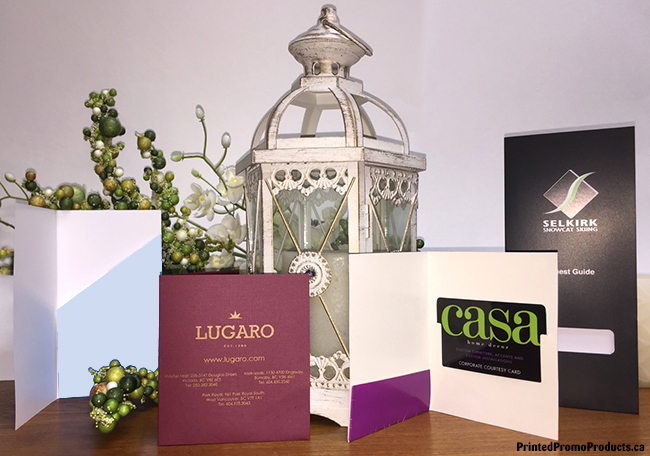 Sizes include #9 and #10 regular and window business envelopes, various invitation, catalog, booklet size envelopes as well as 9″ x 12″ and 10″ x 13″ envelopes. Peel and seal envelopes also available. 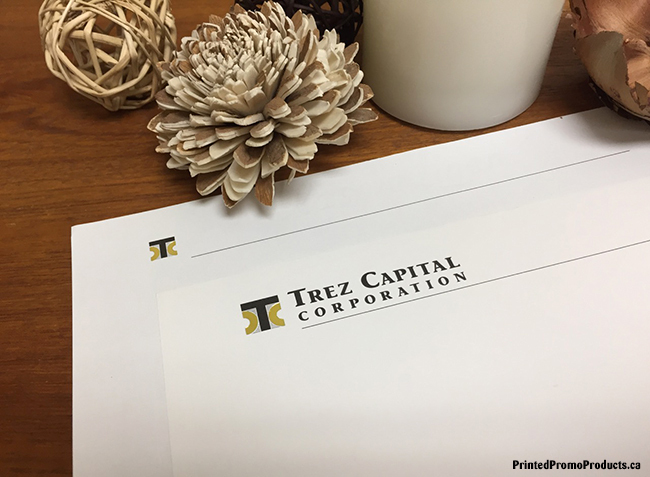 Whether you’re writing a note, presenting a quote or report, our professionally printed stationery will make your brand stand out and leave a lasting impression. 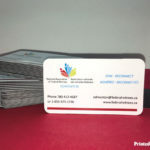 Business card printing and raised printing also available. Request a quote on letterhead and envelopes. Visit our Paper Products page to see what other business marketing products we make.